My busy schedule has kept me from EarthBound-related news lately, so here’s a bunch all at once! 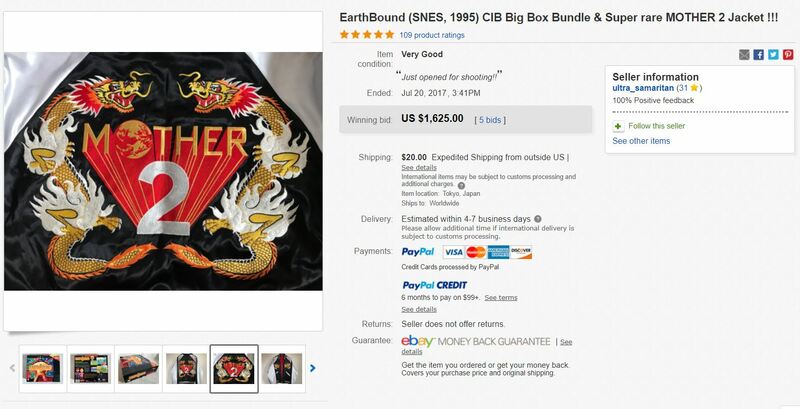 One of the super-duper rare MOTHER 2 dragon jackets finally appeared on eBay the other day. Very few were made and they appear so rarely on auction sites that no one really knows how much they sell for on average. Well, this one turned out to go for $1625 USD… but it also came bundled with a complete copy of EarthBound. I’m actually shocked that it went for something so low! Whoever got it, please tell me how it smells so I can re-create it in scratch-n-sniff form someday. Last month I posted about how another EarthBound Zero prototype cartridge was discovered at a garage sale. It was well documented and got lots of attention from collectors and gaming sites. A few weeks ago the owner put the cartridge on eBay, where it sold for $8276 USD. As far as all the known prototypes go, I think that might be one of the most expensive ones of all! A young man from America who once visited me as a MOTHER series fan is now being interviewed as the creator of a huge hit game. That makes me feel so happy! I’m really grateful to hear that he especially liked MOTHER 3. MOTHER 3 hasn’t been released in America, so he’s experienced the game entirely in Japanese. A year or two ago, Fangamer and Toby ran into Itoi for a few minutes during a trip to Japan. I don’t think Itoi knew who he was at the time, so it’s neat to see his realization now 😛 Hopefully he’ll get a kick out of some of the Japanese writing in the game! I’m probably forgetting more recent big EarthBound series happenings, so if I’ve missed anything let me know in the comments! One bit of news was Earthbound was the grand finale game run for Summer Games Done Quick 2017… it was a glitchless run that raised a lot of money for charity; you (yes, you holding the controller!) should check it out if you get a chance! Oh yeah! 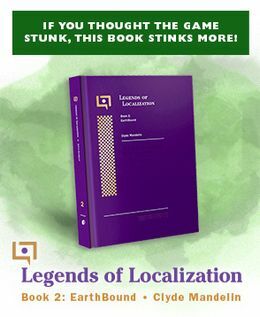 I can’t believe I forgot, I even had some of my EarthBound books as a prize for it! @schmeg: It’s possible he played through the game in Japanese with (or without) a translation guide before the fan translation was completed. It took about 2 years from the time the game was released, and a lot of people didn’t want to wait for the patch. I had Mother 3 imported when it was released and played through it without knowing Japanese. Years later I played it in English once the patch was up. Feels old realizing that date was 10 years since the Simpsons movie came out. What a trip; I still check this site every few days and I saw a comment from BlueStone about his video. More than a decade ago I was in a crappy hotel in Capitola, CA, and as bad as it was, it had WiFi. I remember checking Statement.net and seeing a piano cover of Pollyanna and thinking it was awesome. I played piano and found sheet music for it and learned it when I got back home. I still play music and I still tap that pattern out when I’m nervous. What a crazy little thing that I happened to see that comment. I don’t know if I even watched the video more than a handful of times, but you’re, like, part of my muscle memory, man. Thanks.